Have you always wanted an airbrush tan but had some questions about the process? Many people have similar curiosity before scheduling their airbrush tan in the Delaware County/ Philadelphia PA area. 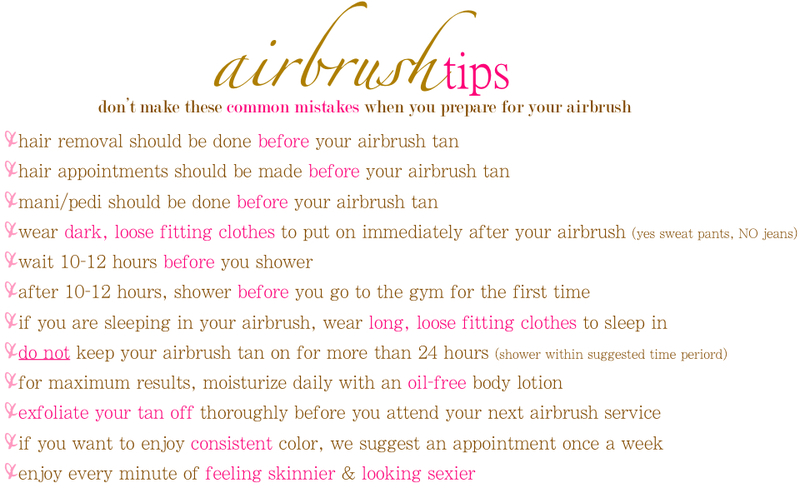 Its really low maintenance and simple, see below for simple spray tanning tips and how to care for your airbrush spray tan, before, during and after! Within eight hours prior to your tanning session, exfoliate with an oil-free product, paying special attention to dry areas like your feet, knees and elbows. Remove all toiletries such as makeup, deodorant or lotions. These products can block the airbrush tanning solution and may negatively affect your tan’s development. Use dark swimwear or undergarments for the actual tanning session. Don’t bring your best pair. Wear dark, loose-fitting clothing when you come in, including flip flops. Tight straps and clothing can affect the tan. Remove jewelry and contact lenses before beginning. Dark swimsuits or old underwear are ideal for tanning in. Tanning solutions wash out of clothing easily, though they may to stain synthetic materials such as light nylon. Protect your lips with lip balm. To give the tanning solution enough time to work, avoid showering, exercising and other ways of sweating or getting wet (such as washing your hands or even letting your dog lick you!) for eight hours. If you’re going to be in the sun, use sun block with an SPF. Avoid long, hot showers or baths and harsh scrubbing, and pat your skin dry. 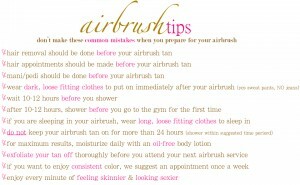 Like every other tan, an airbrush tan lasts longer the better you take care of it! Anti-aging and acne treatments (including skin bleaching cream, salicylic acid, microdermabrasion, serums and toners containing alcohol or witch hazel, Retin-A, skin bleaching cream and others) can cause tans to fade. Using loofahs, waxing, dull razor blades, bleaching, and other abrasive skin treatments and applications can fade your spray tan more quickly. Quick dips in pools and the ocean are OK, but extended swims can fade your tan. Using self tanners on vacation will keep your color up. This entry was posted in Airbrush and tagged Airbrush, Airbrush Spray Tan, Airbrush Tanning, Airbrush Tanning Tech, Delaware County PA Tan, Mobile Spray Tanning, Philadelphia PA Tan, Spray Tanning, Spray Tanning Delaware County PA, Spray Tanning Philadelphia, Spray Tanning Philadelphia PA, Spray Tans Delaware County. Bookmark the permalink.